Not long ago, owning an EV meant you were strictly limited on how far afield you could roam. The typical 70 to 80 miles per charge was a real issue. 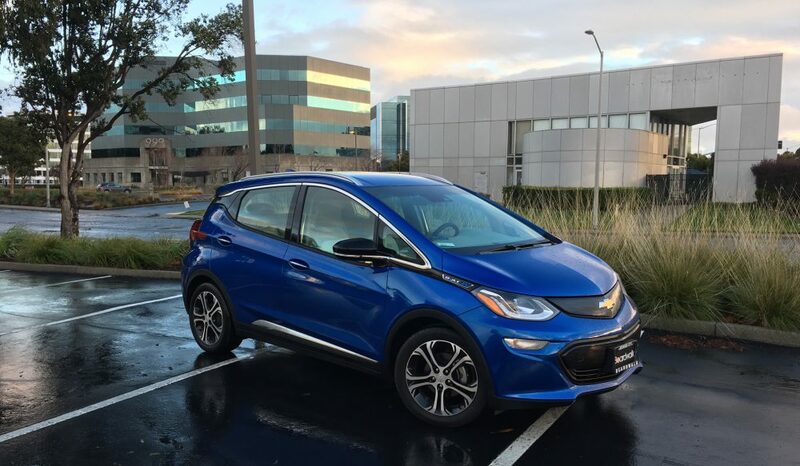 That’s why, when I heard the Chevrolet Bolt EV had an EPA range of 238 miles, I knew it was the only choice for me. I couldn’t afford a Tesla, but really needed decent range. I have a particular reason–my granddaughters live about 80 miles away and I wanted to be able to go visit them in my new car without stopping to charge. So yesterday, nearly three weeks after taking delivery, I made the 165.6-mile round trip. My driving experience since getting my Bolt EV gave me confidence that I could do it. The driving range display gives estimated range, with “Max” and “Min” brackets above and below it, and the estimate appeared to be close to my actual mileage. But you never know until you try. Note: That 203-mile figure is with the climate control on. With it off, the number would be about 10 miles higher. We headed north and plugged in my wife’s iPhone to use Apple CarPlay to enjoy the James Taylor Greatest Hits album No. 1. It provided a soothing experience for a projected hour and a half on the road. I limited myself to 65 mph on the mostly freeway trip. I used the cruise control part of the time, and drove in Low, too. Low, with its greater brake regeneration, adds about 5 percent to the total. We encountered some traffic in the MacArthur Maze in Oakland and around Petaluma (as usual), and inched along for a little while. Those two sections of the trip regenerated more energy than flying along unobstructed, and made the trip take a little longer. But I was encouraged that as we made progress, the projected range was staying higher than I expected it would. At an hour and a half, we had driven 82.8 miles, but the range indicator only moved from 203 to 144–or 59 miles. We had nearly three quarters of the battery charge left. That was fantastic! We spent about four and a half hours with the family, and after a pleasant meal and much animated conversation and some hugs, we climbed back into the Bolt EV and headed home. I wasn’t worried about running out of charge on the way home. This time, it was later, and traffic flowed steadily at 65 mph the whole way. That meant less opportunity to regenerate electricity, and we took more of a hit in the range. The final screen looked like this (darker because it was nighttime when we arrived home). This time, the 82.8 miles reduced the range by 91 miles–about 50 percent more than the trip up there–but not that far off from the actual traveled distance. We had less recharging ability, but saved a quarter of an hour of road time. 53 miles was a fine cushion. Our 165-mile trip showed up as 150 miles of range used. The Bolt EV passed my test. The silence of the motor and smooth ride made our trip pleasant, the upgraded Bose stereo and Apple CarPlay kept us entertained, and I now know my Bolt EV will do the job! My Chevy Bolt EV is Finally Here! I ordered my Bolt EV on October 11, 2016. Today, January 8, 2017, I picked it up and drove it home in the rain. A little water wasn’t going to stop me from getting my blue baby. Sometimes, when you get something you’ve been waiting for, there’s a letdown, but today things went fine and turned out exactly as I hoped they would. And thanks to Don Mays and the folks at Boardwalk Chevrolet in Redwood City, it was painless, too, although I was there for over three hours. It’s a funny story, really. On Friday, I took my 1993 Plymouth van to the junkyard to be crushed for California’s old gas car buyback program. You can read about it here. On the way home, I got a call from Don, my Chevy salesman, letting me know that he wasn’t exactly sure when the Bolt would land at the dealership–but it would be soon. I had been hoping that by finally getting rid of my ancient ride, I’d clear cosmic space in the universe for the Bolt. And–it turned out I was right. At around 4 p.m. Friday I got the call. The truck carrying my car had just arrived (it’s one of those blue ones). I knew that Sunday was going to be stormy, but we got up and waited for the phone call. At 11:12 a.m., just after the dealership opened, Don called and said my car was ready for pickup. So off we went–my wife kindly offered to drive me over. When we arrived, we saw two Kinetic Blue Bolts in front. I checked the window sticker and identified mine. It was on the charger. Apparently, when they brought it over from the service area it had just 90 miles on the battery–not full–but it gathered some more while it sat there waiting for us. The lease process was straightforward. They give you a $2,500 “lease cash” payment, and then take off the Federal $7,500 off the lease price (since I’m not the buyer). You can request what you want the monthly payment to be and how much you want to put down to get it. As it turns out, I had planned to put down a substantial cash amount to lower the monthly payment. I ended up giving them $9,000 ($10,000 minus my $1,000 deposit) and ended up with a $335 a month payment, including taxes. Of course, there’s no January payment–it’s included. I’ll be receiving a $2,500 rebate from the State of California (eventually), and I’m getting $1,000 from junking the van, so it’s not as bad as it sounds. Don brought my dripping wet car into the dealership so we could get pictures (like the one at the top). The car was nicely prepped–shiny and clean. The interior was spotless and with just 3 miles on the odometer. There were even a few pieces of protective plastic still on the door handles. I’ve smelled a lot of new cars as a journalist, but this is the “freshest” of them all so far. I’m glad I chose the lighter interior. All cars receive the white band across the dash and onto the doors, and white console trim, but mine is light gray on the doors and light gray and white on the leather seats, so it feels bright and airy in there. The other choice is dark gray and light gray. Here’s a cool design element–at night, a blue line outlines the lower dash. New cars have a lot of electronics in them, and EVs especially require some explanation. I sat in the car while Don showed me some features. While he installed my temporary registration and removed my window sticker, I set up my OnStar account–a GM benefit for safety and turn-by-turn directions, among other things. The SiriusXM radio came right on, as you’d expect. The Bolt EV has bright, colorful displays in the instrument panel and dash center, so it’s easy to know what’s going on. They put on a little video celebration when you first touch the glowing Start button. Then, the screens appear. They are certainly more interesting to look at than the Ford Sync3 system, which works fine but is more of a monochrome blue. The instrument panel has a large digital speedometer, and the slim typeface is quite stylish. The steering wheel has some controls on the back, like Chrysler/Fiat products, with volume on the right. You can select audio presets on the left side of the wheel. The front of the right side of the wheel has a set of arrows to make selections from a complex menu of inforation and settings, too. The back of the left side of the steering wheel contains a paddle to initiate regenerative braking–kind of like putting your foot on the brake. This can add to your range and give your foot a rest. When the lease process was done, I pulled away, and everything felt right. I cruised along the freeway and through the city of Hayward on my way home. I then took my new car on a couple of errands around town. Nobody noticed it, as far as I can tell, but it was dark and rainy out there. So, my new Bolt EV is finally parked in my driveway, and my adventure has begun. Stay tuned. When you’re driving an all-electric vehicle, you probably spend more time looking at the range number than the miles-per-hour indicator. If the number on it is close to the distance you’re planning to drive, it can be nerve wracking. Luckily, regenerative braking adds to that number. For example, today, I drove 18.6 miles to work in stop-and-go traffic. I started out with 46 miles on my cute little Fiat 500e’s dashboard screen. Amazingly, halfway through the trip, it was at 45–just one mile down. At trip’s end, I pulled into my parking lot and saw 40 on the screen. I regenerated enough juice to take just 6 miles off the battery for an 18-mile ride. Nice! Conversely, if I had gone the entire 18 miles at a steady 70 mph, it would probably read 28–or lower. It’s all a balance.